The smell of death – decaying corpses in charred vehicles, a bitter sulfurous odor emitting from burning buildings – permeated the air as the doctors traveled by car down Castello Road in eastern Aleppo, Syria. It was June 2016, marking five years since the start of the country’s civil war. 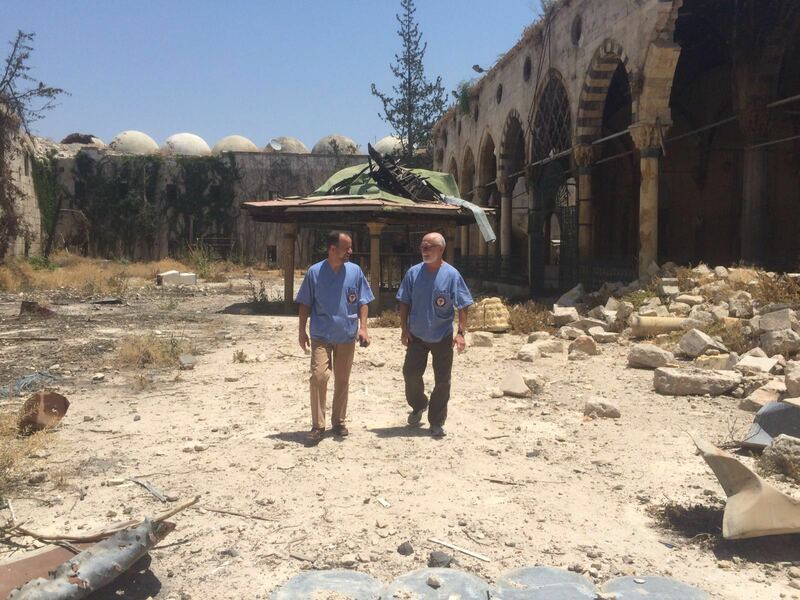 At first, John Kahler, a pediatrician from Chicago who has done medical mission work throughout the world, imagined the scenes in Syria would be similar to the destruction he witnessed in Haiti after the 2010 earthquake. But as the smell of rot and decay became more pungent and children walked across mounds of rubble as if it were a part of everyday life, he realized he had entered an entirely new world of destruction almost too hard to comprehend. Kahler is a pediatrician with ACCESS Community Health in Blue Island. He traveled to Syria with two other Chicago-based doctors, Sam Attar and Zaher Sahloul, with the Syrian American Medical Society (SAMS), a non-profit medical relief organization spearheading efforts to aid the country. All doctors were drawn to Syria to bear witness and stand in support of their colleagues who risk their lives everyday to treat Syrians injured in bombings and airstrikes. Medical personnel in Syria – doctors, nurses, medics – have been especially vulnerable in attacks. To date, the conflict has displaced more than 11 million Syrians and killed an estimated 470,000 people, including scores of civilians. Since the fall of Aleppo, there is concern that the Syrian regime, backed by Russian forces, could next target Idlib, where many evacuees have been taken and health resources are limited to address the needs of the thousands injured. A cease-fire offers some cautious hope, though rebuilding the healthcare system in Syria will be an immense undertaking. Kahler volunteered at M2, a hospital in eastern Aleppo that housed a pediatric unit. (Many hospitals in Syria are code-named to offer some protection; M stands for mashfa, which means hospital in Arabic). There, children with chronic diseases such as hepatitis, asthma, and pneumonia had exacerbated health problems due to poor hygiene and a lack of access to medicine, vaccinations, and routine check-ups. A newborn with meningitis died while he was there; other patients were dehydrated and had jaundice. Many of the patients should have been treated earlier, but parents often feared going to the hospitals in the event of an attack. Baker has led a mapping project to document attacks on medical facilities and personnel through open-source research from social media posts and field source reporting. An estimated 768 medical personnel in Syria were killed between March 2011 and the end of July 2016, according to PHR. Baker says PHR-reported attacks are conservative due to the length of time it takes to document and verify the attack, and that the true numbers may be much higher. Many of these attacks are the result of gunfire, air and rocket strikes, or barrel bombs—explosives made from barrel-shaped containers stuffed with TNT, shrapnel, and other explosives/chemicals. The city of Aleppo, once the largest city and cultural pride of Syria, was at the center of the conflict and subjected to repeated attacks for nearly four years. Until recently, when pro-Syrian government forces regained control, it was roughly divided into the government-held western side and the rebel-held eastern portion. Public health experts warn that assaults on medical facilities could grow worse in other parts of the country if the same tactics are used. Attacks on Syria’s public health system also have impacted people with otherwise treatable diseases like high blood pressure, diabetes, or early-stage cancer; mental health and the psychological impact of the war, especially in children, remains untreated. Persons with disabilities are some of the most vulnerable in war, and for those who survive, the impact of the violence will be life-long. Sahloul has visited the country 14 times, five of them in Aleppo, since the start of the conflict. He is the former president of the Syrian American Medical Society and current senior advisor. He estimates that since the conflict began life expectancy for Syrians has fallen dramatically, and more than 200,000 have died prematurely of non-infectious chronic diseases such as cardiovascular diseases, diabetes, chronic lung diseases and cancer, that otherwise could have been largely prevented. Many of his colleagues have also reported unprecedented rates of malnutrition and babies born prematurely – issues that could have been addressed before the war but are now difficult to manage due to a fragmented public health system. Though he did not witness chemical warfare when he treated patients, his colleagues have reported cases of chlorine gas attacks used against civilians – which may not kill, but leave a lingering psychological impact. For Sam Attar, the same sense of dread and fear he felt when volunteering at Ground Zero in the aftermath of 9/11 consumes him every day while in the hospitals of Syria. Attar traveled to Syria with Kahler and Sahloul in June but stayed in the country a few weeks longer. He volunteered at M10, the main trauma hospital in eastern Aleppo destroyed in airstrikes in October. As an orthopedic surgeon based in Chicago, he is accustomed to dealing with gaping wounds, but the situation in Aleppo continues to unnerve him. In Chicago, he works at Northwestern, a top-rated academic hospital in the U.S. Modern equipment, anesthesia, and trained staff are abundant. But in Syria, he must perform triage, deciding which patient has a better chance to live, leaving others to die. From his office in Chicago, Attar described working in an under-staffed, barebones field hospital with limited resources. “You’re always on edge,” he said. “When a missile lands 15 meters from the hospital, and it shakes, and you’re knocked off your feet. You’re not sure what is going to happen next. Was that a mistake? Was it done on purpose? Is there another one coming? His voice became shaken and soft as he recalled the patients who died in front of him: A pregnant woman who lost her unborn child from the impact of an attack and later died, leaving behind her 10-year-old son; people with such severe trauma that Attar could see their exposed brains or intestines as they waited to be treated; children who were burned so badly that they were unidentifiable. He remembers a 5-year-old boy who was paralyzed from the chest down when shrapnel from a barrel bomb cut into his spinal cord. The boy was gasping for breath. The staff put him on life support, but he died a few days later. But many of the young patients he treated this past summer know a much different Syria. Yet for these doctors who have borne witness to the war, a sense of hope came from seeing the resilience of the Syrian people — the doctor, nurses, and first aid workers who risked their lives to care for their neighbors. Sheila Burt received her Bachelor of Science in Journalism from Northwestern University and is pursuing an MA in Science Writing at Johns Hopkins University. She currently works at the Rehabilitation Institute of Chicago as a grant writer and communications specialist. The Consequences of Untreated Trauma in Syrian refugee Children in Lebanon. A Path to Mental and Physical Health Care for Syrian Refugees in the United States.